Isuzu's new Class 6 entry to the medium-duty truck market, the FTR. (Photo courtesy of Isuzu Commercial Truck of America). 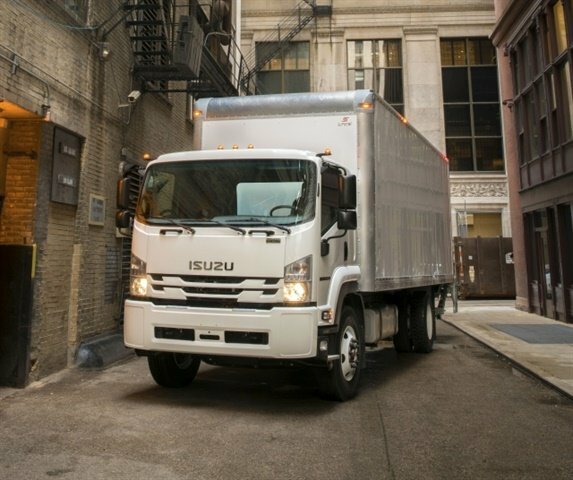 Isuzu Commercial Truck of America, Inc., announced key specifications of its all-new entry in the Class 6 medium-duty truck segment, the 2018 Isuzu FTR. The company made announcements to their dealers at a series of Isuzu Whistle Stops around the country the past two weeks. Available in eight wheelbase lengths ranging from 152 to 248 inches, accommodating bodies from 14 to 30 feet long. The truck is a dock height Class 6 truck. The turbocharged Isuzu 5.2L 4HK1-TC engine propelling the FTR will generate 215 hp and 520 lb.-ft. of torque. The engine will be mated to an Allison 6-speed automatic transmission with power take-off (PTO) capability. Dana axles will have capacities of 12,000 pounds up front and 19,000 pounds rear suspension. Bridgestone or Continental 11R22.5 tires will be fitted to 22.5- × 8.25-inch steel wheels. The FTR is slated to go into production at a new facility in Charlotte, Mich., in mid-2017. “This truck represents our vision of the future of the medium-duty truck industry," said Shaun Skinner, president of Isuzu Commercial Truck of America when the truck was announced at NTEA’s 2016 Work Truck Show in March. "The overall concept of the FTR is to bring to our customers the next generation medium-duty low-cab-forward truck, one that features a clean, durable,highly efficient four-cylinder engine and is the best Class 6 choice for urban pickup and delivery."